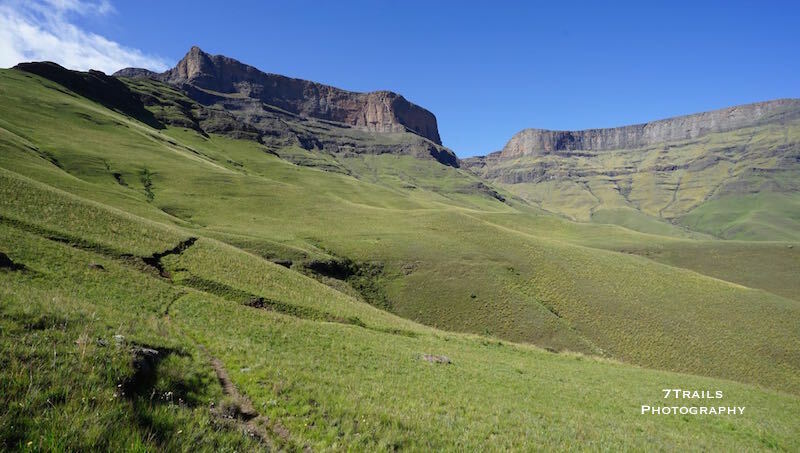 Fresh off not dying in my previous post, my final post on the Drakensberg Grand Traverse covers the climb up Giant’s Castle Pass, an ascent to the highest point in southern Africa, and my return to a country that I never left. 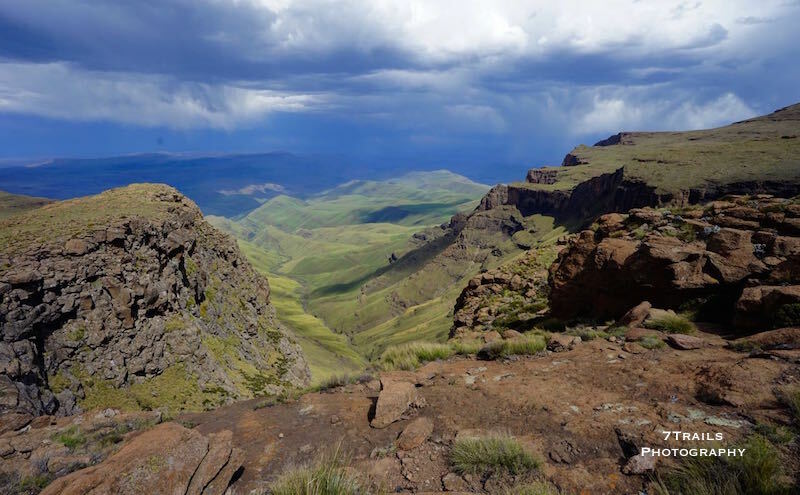 Check out Part 1, Part 2, and Part 3 to read more about this adventure in the Lesotho highlands. I hit the ground (practically) running when I left Giant’s Castle KZN Wildlife Office (1,700m) in the late afternoon. I’d taken a brief intermission from the trail to attend my hiking buddy Chris’ birthday party, so I was once again fully equipped with a new phone, plus a handful of tent stakes to replace the ones destroyed by the packed dirt at the Sentinel car park. Following the Bushman’s River outside of the Giant’s Castle KZN Wildlife Office. I walked up the Bushman’s River through a short, but intense, rain storm that had the bad manners to start its downpour at literally the exact minute I hit the trail. I reached Giant’s Ridge quickly and walked until sunset before setting camp. I’d covered around nine kilometers and had set my self up for a quick climb up Giant’s Castle Pass the next morning. I spent that morning climbing from Giant’s Ridge (2,250m) up the face of the escarpment to Giant’s Castle Pass (3,080m). 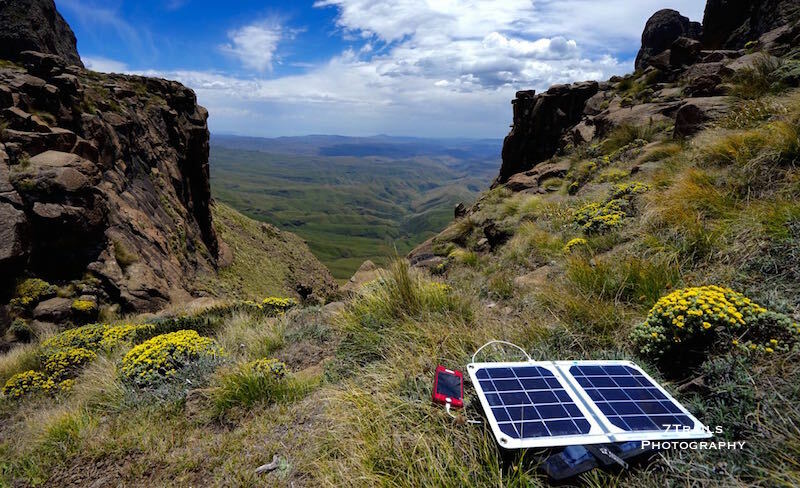 The summit of Giant’s Castle is one of the eight official checkpoints, but I decided to skip it and continued on after taking a quite break to recharge my phone using my Suntastics sCharger-8 solar panel. Climbing toward Giant’s Castle Pass (the big notch in the face of the escarpment). I’d decided early on that I wouldn’t pay much attention to the checkpoints that mark the official route for record keeping purposes. The altitudes involved are not significant, so I didn’t feel like reaching those summits would add much to my sense of accomplishment. Furthermore, despite cutting those corners, I had added two additional escarpment descents/ascents to my itinerary that are not on a typical DGT route. 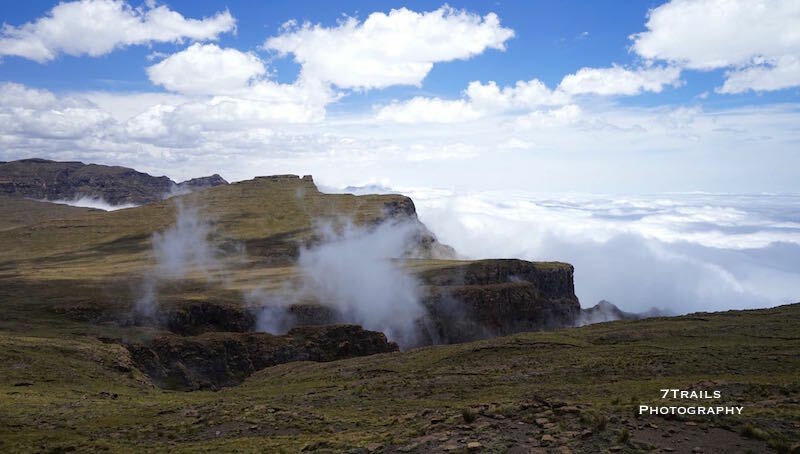 The distance and altitude I lost by not doing all the summits would be more than made up for by those major detours up and down the face the Drakensberg. My route beyond Giant’s Castle followed the border from Giant’s Castle Pass to Lotheni Pass. 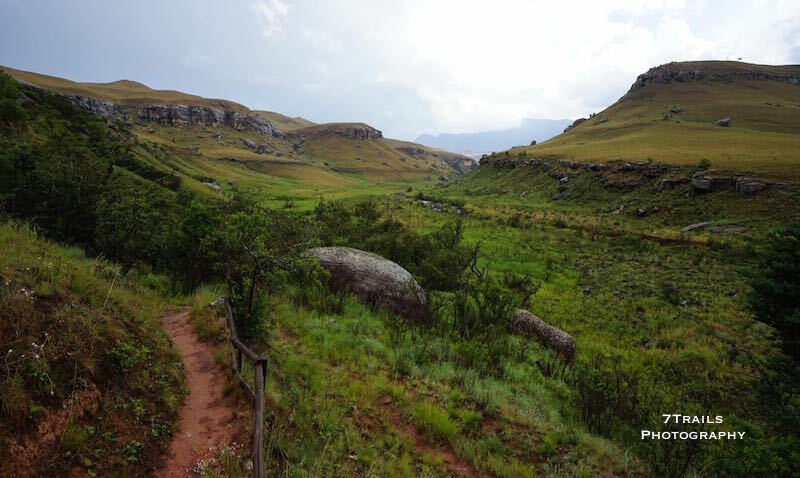 Past Lotheni, I dropped down to the Mokhotlong River valley, passing The Tent and The Hawk (If you haven’t picked up on it yet, whoever named the features in the Drakensberg did a stellar job) on the way to the epic view point at Ka-Masihlenga Pass (3,140m). Unlike much of the hike up to that point, the sky was clear and I had great views down to the underberg in the distance. 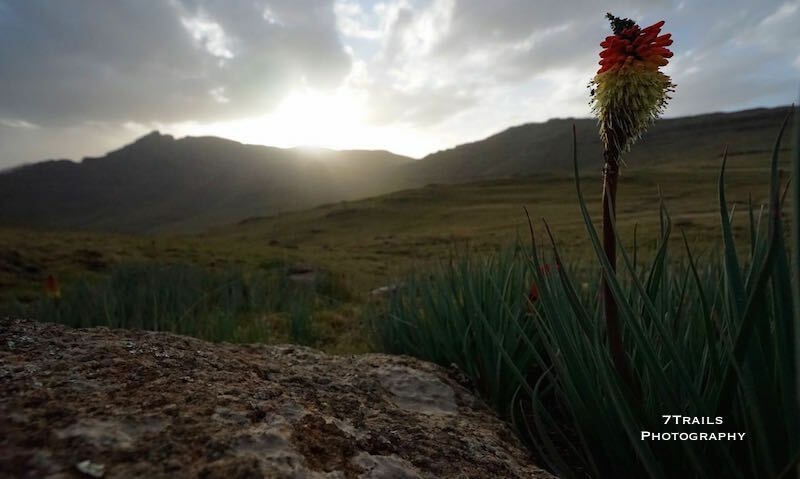 I hiked until the first stars began to poke through evening sky, and then spent that night in a small valley below Mlahlangubo Pass. 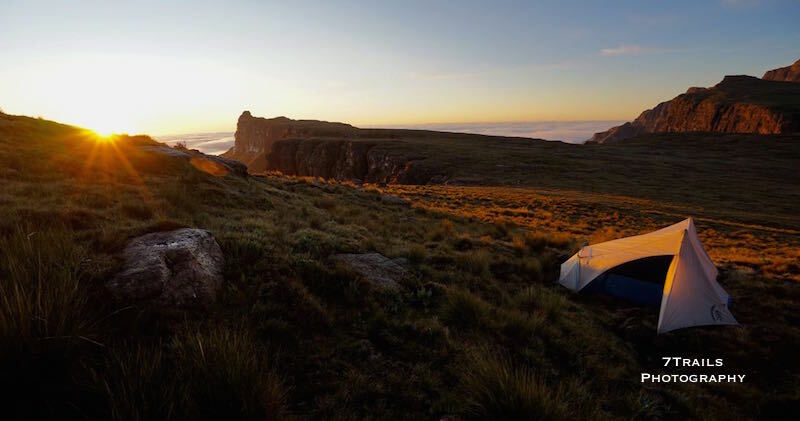 I broke camp at dawn and scaled Mlhalangubo Peak. Dropping down the other side into the Mohelsana River valley, I headed west into Lesotho. I followed the contour line around Lamunram Peak, then traced westward once more along the Mohlesi River, passing a few scattered Basutho huts along the way. I reached Thaba Ntlenyana (3,482m), the highest point in Lesotho and southern Africa, late that morning. 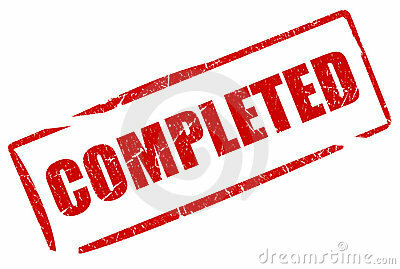 Most of the hard work was already done and I ascended quickly up the last few hundred meters to its summit. I turned south after my quick visit to the summit and dropped several hundred meters to cross the Sehonghong River. I then worked my way up the opposite side of the valley to begin another long, slow ascent. Climbing through the spacious river valley, I came across the densest concentration of Basutho dwellings I’d seen yet. I passed nearly a dozen huts, many with slender wisps of smoke seeping lazily skyward from fires warding off the chill winds, before descending to the Mangaung River before turning southwest. That afternoon was a tiresome slog across the deceptively long and oppressively hot Sani River valley, on the opposite side of the valley from a road that was the first sign of modern civilization that I’d seen in several days. 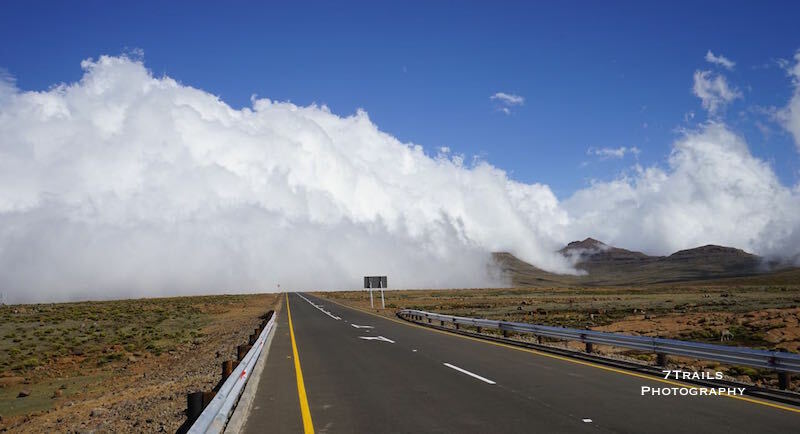 I reached Sani Pass (2,874m) with clouds threatening to breach the escarpment wall, cresting and receding like waves on a beach. I stopped briefly at the Sani Mountain Lodge to refill my water. The clouds finally overran the escarpment as I stepped outside and soon shrouded the Drakensberg in an impenetrable mist. The clouds brought an intense wind and cold rains, turning the afternoon’s hike into a forced march through miserable conditions. 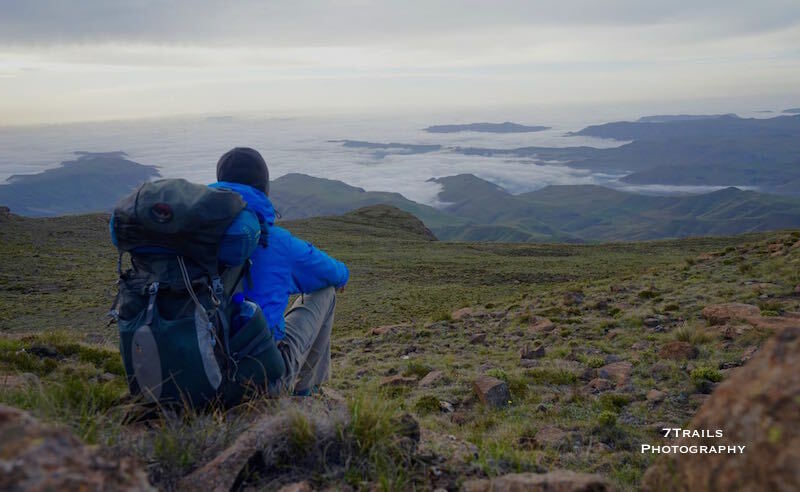 I pushed on for several hours, slowed by the weather and non-existent visibility, before breaking early near Moshoeshoe’s Finger, just west of Hodgson’s Peak North. I rose the next day after nearly 11 hours in my tent. I almost never stop before dark when hiking solo and usually rise early, so the extra hours at rest left me fantastically refreshed. I decamped and headed east toward the edge of the escarpment to ascend Giant’s Cup. I then dropped into the Pitsaneng River valley and crossed over a series of rolling ranges that extended westward from the east-facing escarpment. Heavy weather hit again in the late afternoon and I opted once more to end the day early. I made camp at Rhino Pass, near Thaba Majoe Matso (Verkyker Peak) and just west of Thaba Ngcobo (Rhino Peak). Strong winds and icy rain buffeted my tent throughout the evening. I nodded off to sleep, warm in my sleeping bag, with the sun’s light still visible on the distant horizon below the heavy clouds. I woke well before sunrise on another frigid morning and, after wiping down my frosty tent, hiked south to Mashai (3,309m). One of my favorite parts about hiking solo and off-trail is the freedom it provides to choose my own route. I had two options in front of me: I could take the easy way, by skirting around the large massif of Walker’s Peak (3,306m) on the escarpment edge, or the hard way, by charging right at the Peak and then attempting to descend via Isicatula Pass (3,096m), which showed on the map as a mass of tightly bunched contour lines indicating a nearly vertical descent. I decided to push the limits. I was by now quite comfortable in the Drakensberg and wanted to see just how steep those bunched contour lines would be. I turned toward Walker’s Peak and marched up to the summit. Once on top, I made my way around to the Pass to check out the descent. The map’s contour lines had told it true. Isicatula Pass was an incredibly steep down a narrow chute to the river valley below. I charged in, and thoroughly enjoyed the tricky and challenging descent down one of the most vertical sections I’ve ever hiked. Beginning of descent down Iscatula Pass. The pic does not do justice to how steep this actually was. 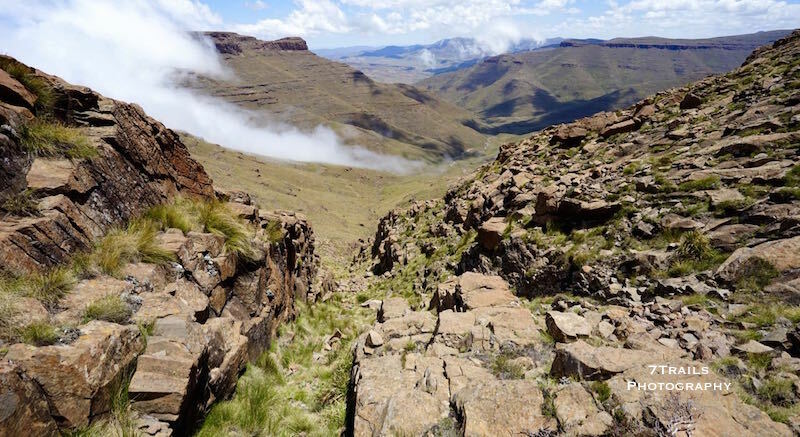 I quickly reached the valley floor and then worked my around the 2,500m contour line of Thaba Ngwangwe (3,064m). Signs of the Basutho were everywhere now as I neared Bushman’s Pass (2,510m), with dwellings and vast herds of cows, sheep and goats covering nearly every hillside. 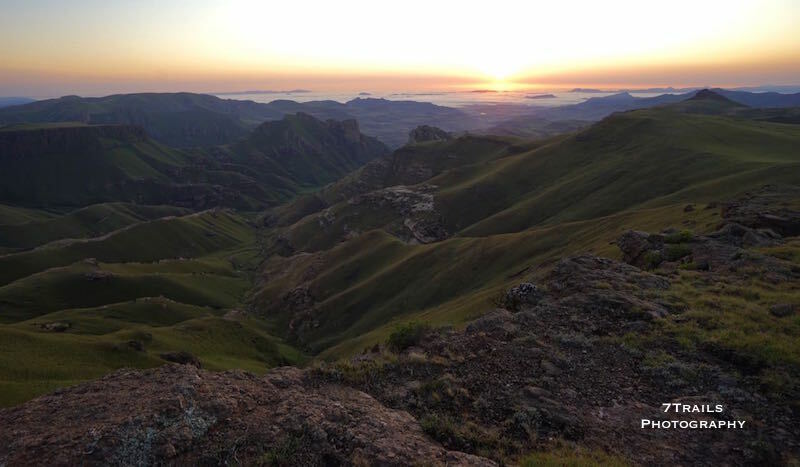 In what had become a habit on the DGT, I stopped early and spent the night at Bushman’s Pass on the edge of escarpment. I wasn’t ready to give up the trail and was still somewhat in shock that my sixth major hike was almost at an end. I began my day shortly after one last stunning sunrise, broke camp for the final time, and sprinted down the escarpment face along the Bushman’s River. I reached the South African border post that marks the end of the trail several hours later. Once there, I got stamped into South Africa. 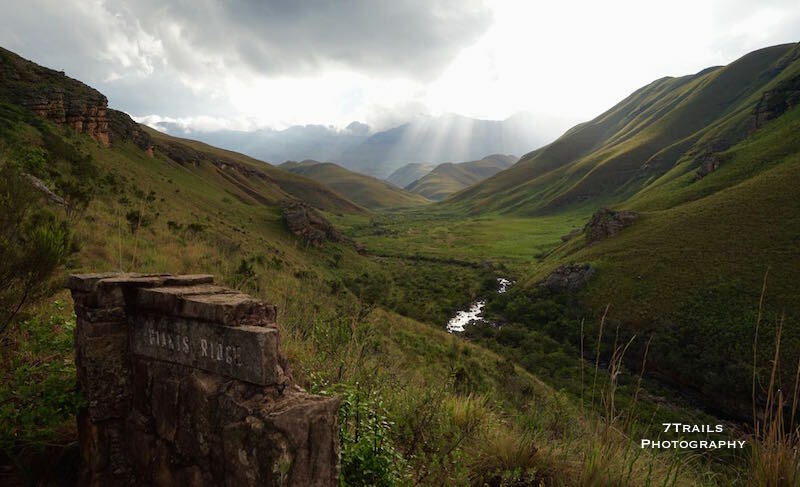 Which was weird because, since there is no corresponding border post on the northern end of the Drakensberg, I had just returned to a country that I had never officially left. Sporting a matched set of entry stamps and no exit stamps, I wandered off down the trail to find a hitch out of the ‘berg and see what else my African adventure had in store for me. That’s it for the Drakensberg Grand Traverse. What an amazing experience on a truly world-class trail! Bring on Antarctica. Truly amazing. 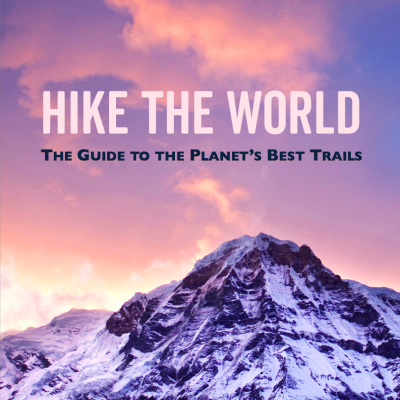 Thanks for capturing the adventure with great photos and great writing. Thanks for the good words! Glad you’re enjoying it.